Lovett Pies have only been in the pie selling business for just over 18 months and they have already won numerous awards including a couple of Silvers at the British Pie Awards 2013. 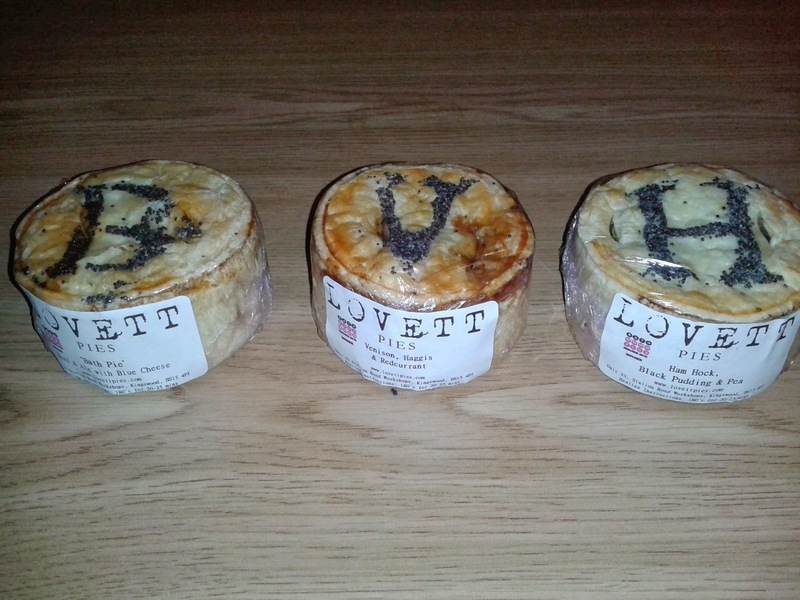 Lovett Pies have already become highly regarded around their Bath base in the South West of England so I was very pleased to get my hands on a whole box of Lovett pies, containing all 7 flavours. Co-owner Phil is the creator of these pies. He was working in a pub as a chef and found that his pies were so popular he was inspired to set up Lovett Pies with business partner Chris. Phil seems to have a way with blending flavours together. 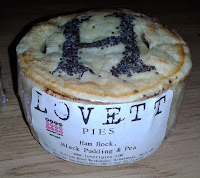 Lovett Pies already set themselves apart simply by some unusual fillings. However, these aren’t strange flavours just to make the pies different. They are flavours which just seem to make a lot of sense! The pies also look beautiful. The pastry looks like hot water crust (like a Scotch Pie) as these pies are perfectly formed cylindrical delights and the pastry holds together so well. The pastry is strong enough for the pie to stand up tall on its own and they are completely encased. From the outside at least I would say they embody the quintessential essence of the ‘proper pies’ that we search for on the Pierate Ship. The perfect golden Colour scored highly. 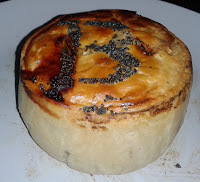 There is a letter on the top of each pie, made of poppy seeds, to signify what flavour the pie is. This wouldn’t be allowed in the British Pie Awards but on the Pierate Ship we have no rules against external non-pastry decoration so I saw this as a good thing, scoring more points for pie Condition. In terms of how the pastry performed in the taste test all the pies were very much the same. The pastry is quite thin so, quite unusually, these pies have more filling than pastry (filling at 66%) which earned them a high Capacity score. This must be the highest filling to pastry ratio I have ever found. The pastry really was secondary here to the filling and the actual taste and texture of the pastry was good but didn’t stand out, partly just because there wasn’t much of it! The price of these pies depends on where you buy them. At the farmers market they are £3.50 or £6.50 for 2. This is a high price for a small pie but reasonable value given the high proportion of filling and meat. What a marvellous pie this was, the best ham pie I have ever tasted, the best black pudding pie I have ever tasted and also my absolute favourite pea pie. Upon slicing the pie open I was impressed by how colourful it was. There weren’t just peas in this pie but also carrots, celery and onion which meant there was quite a lot of veg. The variety of contents meant each bite was different which kept things interesting. Despite the large amount of veg the pie was still really meaty because of the taste of the soft black pudding and the proper unprocessed gammon. It felt like a rounded meal in one small pastry case. Like all of these pies there wasn’t a runny gravy but everything was kept moist by being held together in a small amount of thick sauce. This one seemed to be the most gooey and moist. 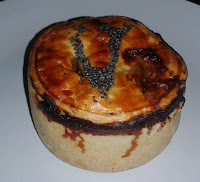 The pie was well seasoned and also contained truffle oil which made the flavour stand out even more. 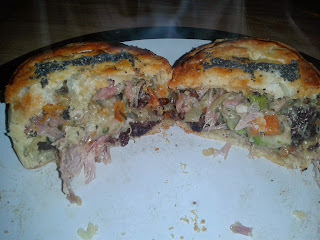 The balance of flavours were spot on and the pie was a real pleasure to eat. It was not at all dry, it was packed with content so it is no surprise this pie scores highly. 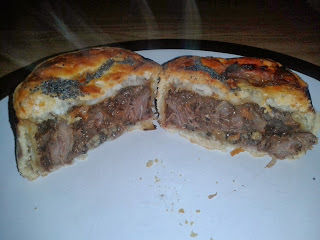 I didn't expect it but the combination of venison and haggis is perfect for a pie! 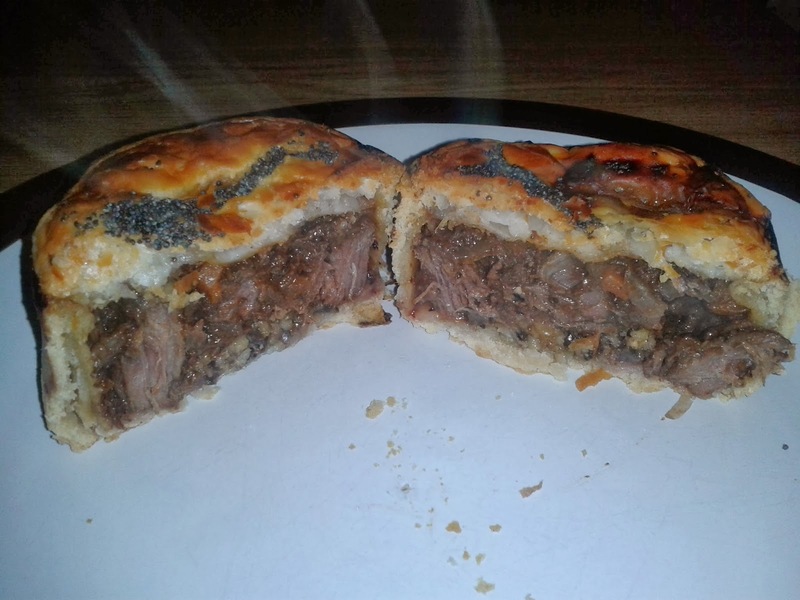 Both have a strong flavour and make this pie deliciously meaty. 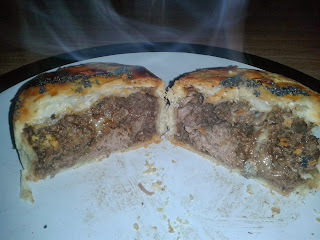 Of course, this Lovett pie was packed with meat as they all were, there was no filler here. I know haggis is made of lamb offal and other such things that I wouldn't normally eat but lamb offal doesn't normally tastes so good! The meat was melt in the mouth and the flavours anything but bland. A hint of sweetness from the redcurrant and carrot was just right for me. The texture was perfect, with a soft filling and little bit of crunch from the pastry. Like all these pies the ingredient list was long but as everything was subtle you couldn't tell that the pie apparently has elderberry concentrate and cacao powder in it. The one thing I did miss with this pie was a bit of gravy. I guess this is not really what Lovett are going for but just a little bit of gravy which oozes out when you slice the pie is my ideal situation. I didn't find this one as moist and as varied to eat as the ham and black pudding. Still an excellent pie and a shame it isn't available all year! This pie was again packed with meat. This time tasty, slow cooked beef which fell apart easily. The cheese tasted nice and unlike some Steak & Stilton pies you could actually taste the blue cheese, certainly a good thing in my book. For the Ham and Black pudding the fact that the filling wasn't mixed seemed like a good thing as it gave a variety to the flavour. However for this pie I felt it was a bad thing. There were some really cheese bits and then some mouthfuls of beef which tasted a bit dry without the cheese to keep it moist. Not a bad effort but not as good as the other two. So in summary we recommend you get yourself some of these pies to try. The variety of flavours mean there is sure to be something for everyone. It is worth noting they really are not very big pies (200g) and I did eat all 3 of these in one go! However, being a Pierateer I do have an usually high love of pie so don’t take this as representative! Despite being small they really are All Killer, No Filler. I have never seen pies with such a lot of filling. Because these pies look so good I can really see myself buying them for those occasions where you want to make an impression. They can also be eaten cold and then perhaps the lack of gravy will mean these are the perfect portable snacks? 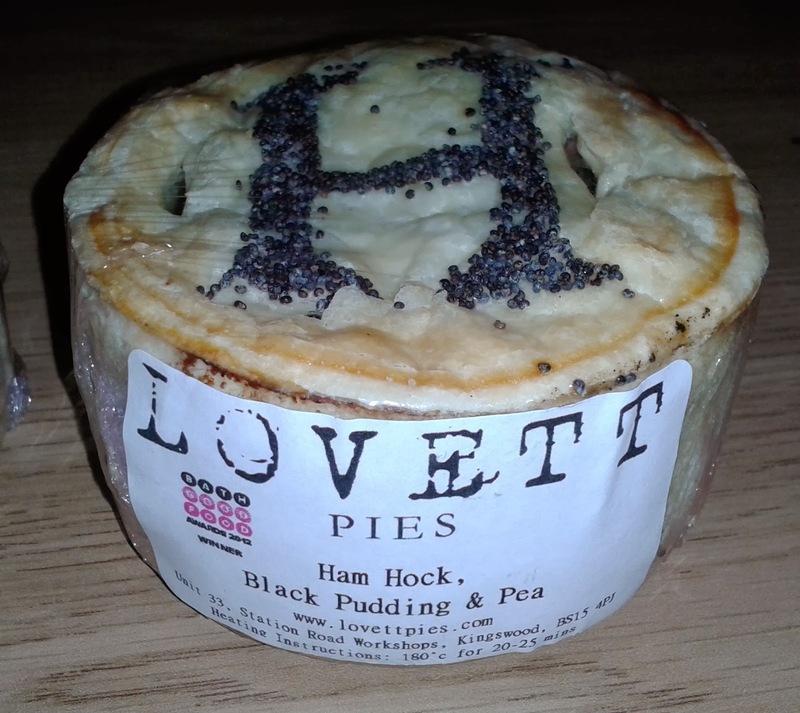 You will find out more about this in my next Lovett's Pies review. 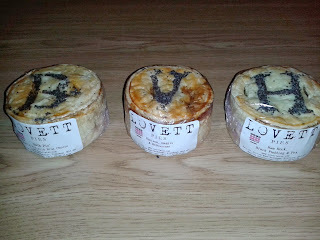 Lovett Pies attend Bath and Swindon farmers markets every week. Their pies can also be found in various pubs across the South West.